Equipped with the state-of-the-art satellite racking system, RapidRunner, Colby Storage Solutions can handle all of your satellite racking needs. Semi-automated, dynamic, and high-density storage at its best! The Dematic RapidRunner is a Pallet Runner that runs up and down the lanes in a high-density, multiple-deep racking system with the sole purpose of transporting pallets from one end of the rack to other. 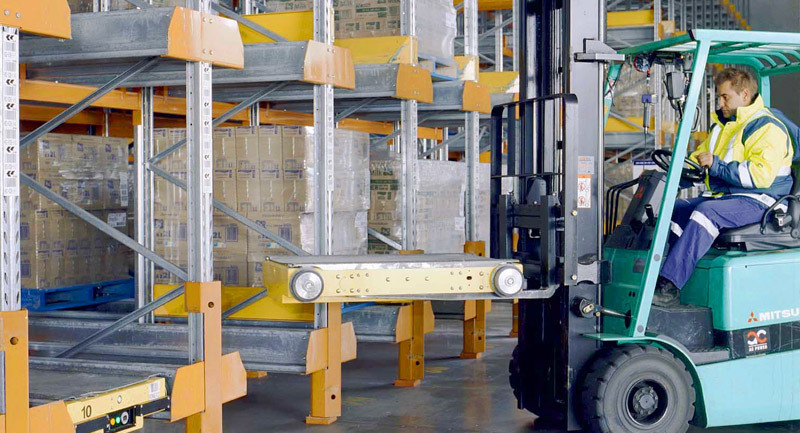 Our RapidRunner carts run on rails that have been specially designed by ColbyRACK, and can be moved between lanes and beam levels with a forklift. This state-of-the-art Satellite Racking System is capable of running up and down lanes, retrieving pallets and bringing them back to the front. This means that Colby’s RapidRunner will ensure denser storage and space-efficiency, while also increasing the productivity of forklift drivers, as they can perform other tasks while the RapidRunner is shuffling pallets into place. The RapidRunner Satellite Racking System is the ideal solution for any application where high storage density is a must, and is particularly beneficial in chilled environments, such as freezers. The RapidRunner system is also ideal for buffering stock at shipping docks, prior to loading up trucks for delivery. Suitable for either a first in/first out (FIFO) configuration, last in/first out (LIFO) configuration, or a combination of both, there are countless benefits to this Satellite Racking System. At the forefront of the industry, Colby Storage Solutions has built a reputation synonymous with success. Murray Goulburn, Australia’s leading processor of milk and the country’s largest exporter of processed food, commissioned Australia’s first RapidRunner high density storage system at its Integrated Logistics Centre (ILC) in Laverton, Victoria.